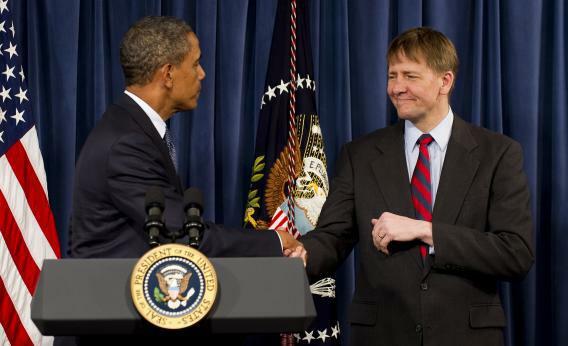 President Barack Obama shakes hands with newly appointed Director Consumer Financial Protection Bureau Richard Cordray during an event at CFPB in Washington, DC, January 6, 2012. The White House insisted Thursday that President Barack Obama acted within his rights by defying Congress and installing a new consumer chief, despite criticism that he usurped his powers. My friend Adam Serwer has come up with a clean, pithy way of describing the Senate GOP’s filibuster threat against any possible CFPB head: nullification through procedural extortion. It’s best to read the letter signed by all but two Senate Republicans, promising to block—for the third time—any possible CFPB head. Last week the U.S. Circuit Court of Appeals for the D.C. Circuit ruled that Obama’s so-called “recess” appointments to the National Labor Relations Board (NLRB) last year are unconstitutional. Although the specific facts of that case involved only the NLRB, Cordray was “recess” appointed at the same time and in the same manner as the alleged NLRB “appointees.” The Circuit Court’s decision, said McConnell, thus applies with equal force to Cordray’s alleged appointment to the CFPB. So the court hasn’t struck down the CFPB nominee’s decisions. But maybe it would! Thus, CFPB delenda est, or at least replaced in the way Republicans tried, and failed, to replace it when we had this drawn-out debate in 2010. Replace the single Director with a board to oversee the Bureau. This would provide the same checks on the ability for a single person to dominate the Bureau that exist at other independent federal agencies. Of course, Republicans have been habitually blocking appointees to another “independent federal agency,” as they just wrote in the letter. More veto points, more vetos. Subject the Bureau to the Congressional appropriations process. This would provide oversight and accountability to the American people on how public money is spent. The trick here: House Republicans have already tried to move legislation to do this and then defund the CFPB. “Watchdog” agencies have come under the scalpel in previous Republican budgets. The “oversight” nag isn’t entirely cynical, except for the long-term plan that’s pretty much pure cynicism. Establish a safety-and-soundness check for the prudential financial regulators who oversee the safety and soundness of financial institutions. This would help ensure that excessive regulations do not needlessly cause bank failures. This is cant, but previous Republican ideas, like attorney-client privilege for bureau research, fit into this rubric and would have—sensing a pattern now—weakened the bureau. But the entire premise of the letter is flawed. How do you pass these reforms, given that Democrats control the Senate? You don’t. How do you stop the White House from doing another end-run around the Senate and appointing a new director? You can’t. But you can controversialize the CFPB by forcing the president to staff it via “tyrannical” means. And given that Obama’s won two presidential elections, and that the last blocked CFPB director has won a Senate election, denying a mandate takes innovative thinking.